Having the right tool for the job is essential. Having all the right tools when you need them is even better. The Fluke 117/323 Electricians Multimeter Combo Kit gives you the best in a versatile, rugged multimeter and a fast-acting, general purpose clamp meter. The Fluke 117 provides non-contact voltage detection, an AutoV/LoZ function, Min/Max/Average readings, plus frequency and capacitance measurements. It's easy to use and saves you time. Electrical meters need to handle whatever comes up on the job. 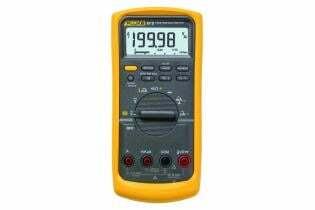 That's why the Fluke 117 Electrician's Multimeter is certified for use in CAT III 600 V environments. True RMS measurements and optimized ergonomics make the Fluke 323 True RMS Clamp Meter the best general purpose clamp meter for commercial and residential electricians. The Fluke 323 model is ideally suited for current measurements up to 400 A in tight cable compartments. Together, the Fluke 117 Electricians Multimeter and 323 True-rms Clamp Meter give electricians the right tools for the job. Frequency is AC coupled, 5 Hz to 50 kHz for AC voltage. Frequency is DC coupled, 45 Hz to 5 kHz for AC current. Temperature Range/Resolution: -40 °F to 752 °F / 0.2 °F. Từ phòng điều khiển cho đến nhà máy, dòng đồng hồ vạn năng số Dòng Fluke 80 đã gây được uy tín là đồng hồ vạn năng số mà các kỹ sư & kỹ thuật viên công nghiệp tin tưởng.